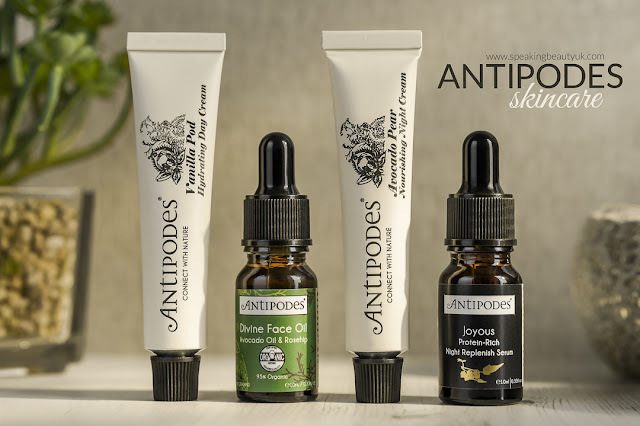 I've wanted to try the skincare products from Antipodes for a very long time but never got round to actually buying it. 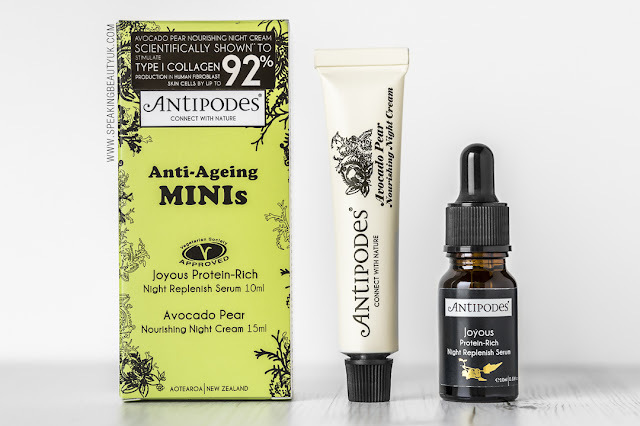 But then I saw the Antipodes Moisture Boost Minis Kit & the Antipodes Anti Ageing Minis Kit. I always enjoy getting travel sizes, especially when it's the first time I'm testing a brand and still getting to know what I like or don't in their range. Buying minis means I can spend less and try more. Win-Win! This set comes with the most loved Antipodes moisturising products, which are the Antipodes Divine Face Oil (10ml) and the Antipodes Vanilla Pod Hydrating Day Cream (15ml - tube). The face oil is supposed to stimulate collagen by up to 51% and offers a formula rich in ingredients like avocado oil, Vitamin A, B1, B2 & D, as well as antioxidants to help protect the skin against damage. This oil feels so luxurious on the skin and leaves it really soft without looking greasy. Has a subtle herbal like scent to it, which I really like. I have been pairing this oil every morning with the vanilla pod moisturiser, which is a light cream that contains the famous antibacterial manuka honey so it doesn't only hydrate, it also helps keep blemishes away. Not to mention it also smells really good. My skin feels lovely all day long whenever I wear this incredible duo and I will certainly purchase the full size once the minis end. 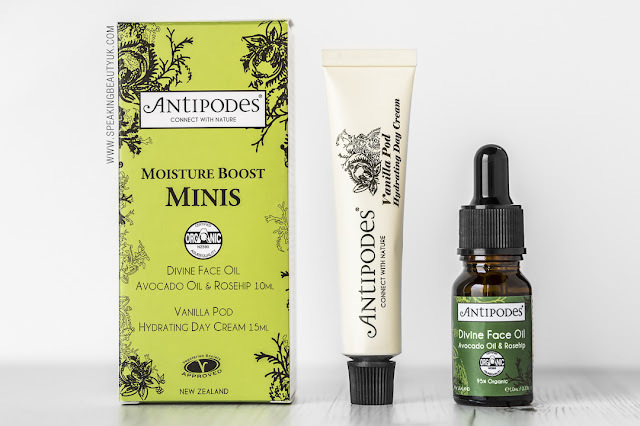 The Antipodes Moisture Boost Minis retail for £12.99 and I bought mine from feelunique.com. This is the night time set, comprised of the Antipodes Joyous Protein Rich Night Replenish Serum (10ml), which is an oil based silky serum that helps repair dry and damaged skin. Its ingredients comprise of Himalayan Goji, red raspberry seed oil blends with blackcurrant, kiwi oil and more. Love the smell and the very smooth consistency of the serum. Reminds me a bit of my well loved Estée Lauder ANR serum. Leaves my skin feeling ultra hydrated and soft in the morning. The other product in this set is the Antipodes Avocado Pear Nourishing Night Cream (15ml - tube). The promise is that this natural wonder is filled with antioxidant extract from grape seeds to help neutralise free radical damage that can lead to premature ageing. As well as that, it also has manuka honey to fight spots and keep the skin moist. This cream has shown to stimulate collagen up to an impressive 92%. Due to that, it's supposed to reduce wrinkles, skin roughness and dryness. While I do like how my skin feels when I wake up after wearing these 2 products together, I have to say I don't think I would repurchase the night cream, as the smell is just too strong and unpleasant for me. It's a shame but skincare scents are very important for me. This cream smells like VapoRub. No joke! Even my husband complained about the smell once and he's never done that before. You know men... they rarely notice anything. So that's a bad sign. lol This set retails for £13.99. So overall, I'm very pleased I got to try the Antipodes Minis. I love everything in the sets, with exception of the night cream, simply due to its smell, which I can't stand. Trying these products made me want to explore the Antipodes further. Maybe I'll get their popular Manuka Honey Mask next.